Funeral Directors and Embalmers in Iowa are required to complete 24 hours of continuing education every renewal period. The renewal period is every 2 years on the 15th day of the licensee’s birth month. NOTE: Only 12 hours (50%) of the total CE requirement may be obtained from online or home study courses. The Iowa Board of Mortuary Science does not approve continuing education providers. It is up to the licensee to determine if the course is acceptable. Our courses meet the Iowa rules for continuing education. 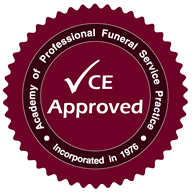 Our courses are also approved by the Academy of Professional Funeral Service Practice (APFSP).